The aim of this study is to compare the physical wedge (PW) with enhanced dynamic wedge (EDW) to determine the difference in the dose distribution affecting the treated breast and the contralateral breast, lungs, heart, esophagus, spine, and surrounding skin in the radiotherapy of breast cancer. Computed tomography (CT) data sets of 30 breast cancer patients were selected from the database for the study. The treatment plans which were executed with PW were re-planned with EDW without changing the beam parameters. Keeping the wedge angles same, the analytic anisotropic algorithm (AAA) with heterogeneity correction was used for dose calculation in all plans. The prescription was 50 Gy in 25 fractions. The dose- volume histogram (DVH) of the planning target volume (PTV) and critical structures of both PW and EDW plans were analyzed. The analysis showed that the maximum dose within the target volume is higher in EDW plan compared to PW plan. However the PTV conformity index (CI) remained the same in both plans. For all the critical structures, the EDW technique offered less dose compared to PW technique. The effect of volume of the contralateral breast on the dose to contralateral breast and the effect of volume of PTV breast for patients with carcinoma left breast on the dose to heart were studied and analyzed for the two wedges. No correlation between volumes and dose parameters was found for the two techniques. The number of monitor units to deliver a particular dose with EDW field is less than that of PW field due to change in wedge factor. As EDW produces less scattered dose to structures outside the treatment field, the risk of a second malignancy can be reduced with this technique. There are various studies that prove breast conservation surgery (BCS) followed by radiotherapy to the whole breast is the preferred mode of treatment in early breast cancer., In conventional radiotherapy, the wedge filter technique is the most commonly used. In three-dimensional conformal radiotherapy, a multileaf collimator (MLC) is used to confirm the shape of the radiation beam to avoid the nearby critical structures. In Varian Clinac-600C machine, two types of wedges are available. One is a physical wedge (PW) filter which is made of an alloy of steel and lead. It is available in 4 angles (15°, 30°, 45°, and 60°) and 4 orientations (in, out, right, and left). The other is an enhanced dynamic wedge (EDW), in which wedging effect is created by moving the Y-jaws while the beam is on. It is possible to create wedge distributions for wedge angles 10°, 15°, 20°, 25°, 30°, 45°, and 60° by selecting the appropriate segmented treatment tables (STTs) called golden STT. Dosimetric characteristics of PW and EDW and the clinical differences have been described elsewhere., Several studies have shown that there is a possibility of the patient developing radiation-induced cancer following the treatment of malignancy of breast cancer. Many investigators have quantified the risk of second primary breast cancer in the contralateral breast after radiotherapy for the first breast cancer. According to their study, women <40 years of age with follow-up periods more than 5 years had a radiation risk of 3.0% and the dose response was significant. Women <40 years of age who received a radiation dose more than 1.0 Gy to the contralateral breast had an elevated, long-term risk of developing a second primary contralateral breast cancer. The risk is inversely related to age at exposure and is dose-dependent. Certain studies have mentioned that the risk increases with the use of wedges in the medial beam., Some have compared the dose to the contralateral breast, ipsilateral lung, and the whole lung in tangential field radiotherapy for primary breast cancer using “dynamic wedge” and PW., They reported that the dose to normal structures is reduced using the dynamic wedge, thereby reducing the normal tissue complication probability. The aim of the study was to investigate the effect of using PW and EDW on planning target volume (PTV) and all the critical structures during primary breast irradiation using radiotherapy treatment planning system (TPS) Eclipse v-13. The treatment plan of thirty patients who underwent BCS for infiltrating duct carcinoma breast and stage (T (1-2)N0M0) and who already underwent radiotherapy in the period 2012–2013 were selected for the study from the database. Twelve patients were treated for disease of right breast and 18 for left breast. For actual patient treatment, the plans were generated with PW for a dose of 50 Gy in 25 fractions. The same computed tomography (CT) data sets, target volumes, and organs at risk (OAR) were used for the study. All the patients were treated in the supine position with both the arms abducted and immobilized with breast board to reproduce daily setup and minimize setup errors. All the CT simulation images were acquired in a 16 slice CT simulator (GE Optima 580W). Scans of 5-mm slice thickness were acquired for each patient covering just below the mandible and extending 5–6 cm below the inframammary fold. A radiopaque wire was placed around the breast to be treated, to define the field borders. For each patient, PTV and OARs such as ipsilateral lung, contralateral lung, heart, contralateral breast, esophagus, and spine were contoured by the radiation oncologist. Skin was contoured as a thin strip of 5 mm extending from patient outline to the anterior surface of PTV and 2 cm equally in craniocaudal and medial and lateral directions. For each patient, plans that were already generated using PW were recalculated with EDW in “Eclipse” TPS v13 without changing the beam parameters. Varian's Clinac 600C machine with 6 MV photon beam was used for treatment. Two opposing tangential half beams were placed to cover the whole breast. The medial field border was placed near the midline of the patient. The superior border was placed just below the level of clavicle. The inferior border was placed 1 cm inferior to the inframammary fold. Gantry angles varying from 300° to 310° were used for medial tangent beam and angles ranging from 120° to 130° were used for lateral tangent for left breast cases. Similarly, gantry angles varying from 50° to 60° were used for medial beam and angles ranging from 230° to 240° were used for lateral tangent for right breast cases. For plans using PW, collimator angles of 8°–10° were given to reduce the volume of ipsilateral lung coming in the path of the beam. As PW can be inserted in any of the four orientations, this collimation was sufficient to produce the wedging in the required orientation. But with EDW, as wedging effect is produced by the movement of Y-jaws, a collimation of 90° or 270° was mandatory to produce the wedging in the required direction. Additional collimation of 8°–10° was given to reduce the volume of ipsilateral lung coming in the radiation field. Both EDW and PW plans did not use MLC as collimator rotation was different for both. The wedge angles varied from 15° to 30°. Same wedge angles were used for both plans without changing other beam parameters. Using Beams Eye View option in Eclipse TPS, fields were placed to minimize the dose to heart, contralateral breast, ipsilateral lung, and maximize the PTV coverage. The dose was normalized to 100% at midplane where a reference point called weight point was put to normalize the prescription dose. This point was placed 2–3 cm anterior to the ipsilateral lung on the central axial slice of the treated breast PTV. The same weight point was used for both PW and EDW. The analytical anisotropic algorithm (AAA Version 13), a photon dose calculation algorithm (grid size 2.5 mm) with heterogeneity correction was used for dose calculation in all plans. For all patients, dose was given in 25 fractions of 200 cGy to deliver a total dose of 50 Gy to the whole breast. The plans were compared using dose-volume histogram (DVH) tool. The DVH of the PTV and critical structures of both PW and EDW plans were analyzed. The criterion for PTV coverage was to deliver 95% of prescription dose to 95% of PTV and also not to exceed 110% of the prescribed dose in more than 1 cc of the PTV. CI = reference isodose volume/target volume. Here, reference isodose volume was taken as 95% isodose volume of the PTV. Target volume is the total volume of the PTV. CI was calculated for both sets of plans and compared. During breast radiotherapy, the critical organs such as contralateral breast, heart, lungs, and skin receive substantial amount of radiation due to their proximity to treated breast. Various groups have defined dose- volume constraints for the radiotherapy planning of breast cancer.,,, Dosimetric predictors of radiation (RT)-induced lung injury (pneumonitis) are mean lung dose and percentage of the total lung volume exposed to a dose of 5, 10, and 20 Gy (V5, V10, and V20). As per RTOG protocol, the acceptable criteria for ipsilateral lung are V20 <20%, V10 <40%, and V5 <55%. The V5 of the contralateral lung should be <10%–15%. RT-induced heart injury may manifest as acute or late toxicity. Pericarditis is an acute injury often transient but may be chronic. Late injury includes congestive heart failure, ischemia, coronary artery disease, and myocardial infarction., RTOG protocols have defined heart dose-volume constraints for left-sided breast cancer as, V20 <5%, V10 <30% and mean dose <4 Gy as ideal. However, V25 ≤5% and V10 ≤35% and mean dose <5 Gy are also acceptable. Dose-volume constraints of the heart for right side breast cancer were defined to keep V20 = 0 and V10 <10% as ideal, but V25 = 0 and V10 <15% are also acceptable. Some of the cardiac parameters were chosen to reflect available data regarding the risk of cardiac toxicity. In the patient group selected for the study, the volume of PTV of carcinoma left breast patients ranged from 784 cc to 2260 cc. 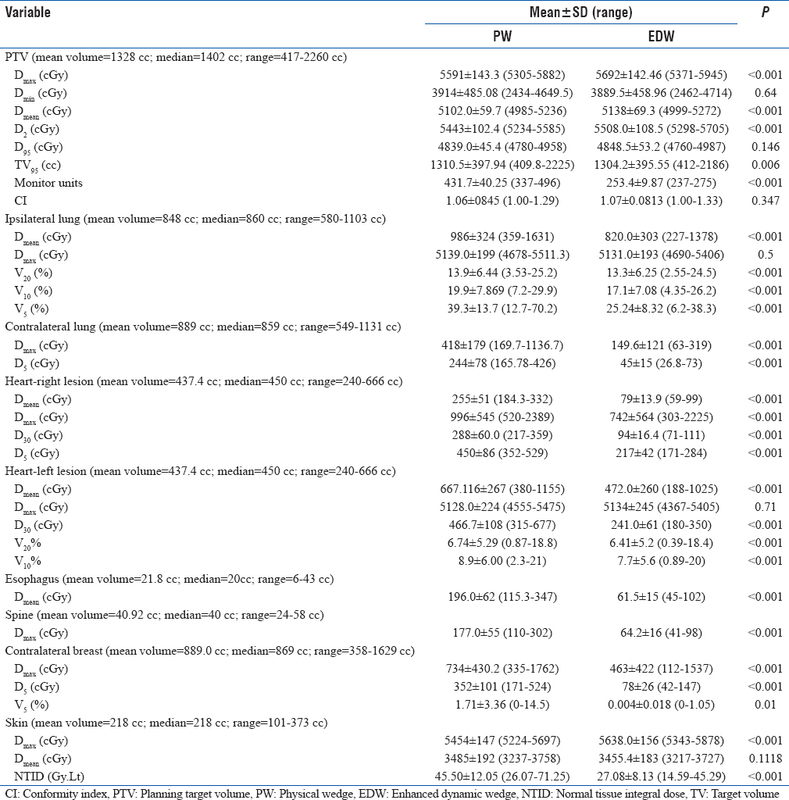 An analysis was also done to find a correlation between volume of PTV of left breast and dose parameters like Dmean, Dmax, D30, V20, and V10 for heart for the two techniques. The dose to the contralateral breast is because of the medial tangent beam, and the result of collimator scatter, leakage, scatter from wedges, etc. The RTOG breast study protocol recommends keeping the Dmax of the contralateral breast <3.3 Gy. In this study, volume of contralateral breast ranged from 358 cc to 1629 cc for 30 patients. Here also, an analysis was done to find any correlation between volume of contralateral breast and dose parameters such as Dmax, D5, and V5 for the two techniques. Emami et al. defined the tolerance dose of the spinal cord based on the irradiated length of the cord as follows: 47 Gy to 20 cm, 50 Gy to 10 cm, and 50 Gy to 5 cm. In RTOG protocols, the maximum dose to the spinal cord is limited to 45–50 Gy. In this study, we have compared the maximum cord dose between the two plans (PW and EDW). During the treatment of whole breast after BCS, the esophagus seldom comes in the path of radiation. However, we also tried to estimate the mean esophagus dose from the two plans. For skin, toxicity includes erythema, hyperpigmentation, and skin desquamation. Late toxicities include skin fibrosis, telangiectasia, contracture, and even necrosis., For patients treated with BCS, where the skin is not at risk, the selection of adequate beam energy, careful contouring, and plan evaluation (reviewing the Dmax and hot spot regions) may help to spare skin (4–5 mm thickness to include the epidermis, dermis, and hypodermis) to reduce acute and late toxicity and subsequently maintain cosmesis. Emami et al. estimated tolerance doses of skin (TD5/5) as 50 Gy for 100 cm 2, 60 Gy to 30 cm 2, and 70 Gy to 10 cm 2. In the present study, the maximum dose and mean dose received by skin in both plans using PW and EDW have been compared. The data obtained was statistically analyzed using two-tailed paired Student's t-test. [Table 1] shows the comparison of PTV and critical structures between PW and EDW techniques using dosimetric parameters. There was a significant difference between dose to 2% volume of PTV for PW and EDW (P < 0.001). However, there was no statistical difference in the PTV CI of plans calculated using both wedges. [Figure 1] shows the dose distribution of a representative case (left breast) in transverse, sagittal, and coronal slices using PW and EDW. From the figure, it can be seen that the isodose distributions are almost similar for both PW and EDW. The dose to all the critical structures were less for plans calculated with EDW when compared to PW (P < 0.001). The number of monitor units required to deliver dose with EDW is less compared to PW due to the difference in the wedge factors. This might be the reason for the reduced dose to the critical structures outside the treatment field. The DVH for PTV and critical structures using PW and EDW for a representative patient is shown in [Figure 2]. There was no correlation between the volume of contralateral breast and the dose to contralateral breast for both wedges. Similarly, there was no correlation between volume of PTV breast and dose to heart. Volume alone may not be the deciding factor as other parameters such as beam orientation, wedge angles, beam weights, etc., may also influence the dose to the nearby critical organs. The studies have shown that the scatter radiation to contralateral breast may play a large part in the induction of secondary breast cancer.,,,, In the studies by Warlick et al. and Akram et al., a comparison of the dose to the contralateral breast was made between EDW and the standard physical wedge plans. The measurements revealed a significant reduction in the contralateral breast dose (CBD) with EDW compared to the standard physical wedges. The average dose with EDW was 2.7%–2.8%, whereas with the standard wedge, it was 4.0%–4.7% in the study by Warlick et al. Comparable results are seen in the present study too where the average of dose to 5% volume of contralateral breast reduced from 7.0% in PW plans to 1.5% in EDW plans. Akram et al. concluded that EDW is a practical clinical advance which improves the dose distribution in patients undergoing breast conservation while minimizing dose to the contralateral breast, thereby reducing the potential carcinogenic effects. The DVH analysis of the present study also showed that the critical organ sparing is better with EDW plan compared to that of the PW plan. The dose to heart using PW and EDW for 12 right breast patients and 18 left breast patients was compared. For the right breast cases, the mean dose, the maximum dose, and D30 and D5 values of heart were significantly less for EDW plans (P < 0.001). For left breast plans, all the above parameters (Dmean, D30, V20, and V10) except the maximum dose to heart were significantly less for the EDW plans than the PW plans (P < 0.001). Wang Dan et al. also recommended EDW compared to PW due to the reduced dose to contralateral breast. 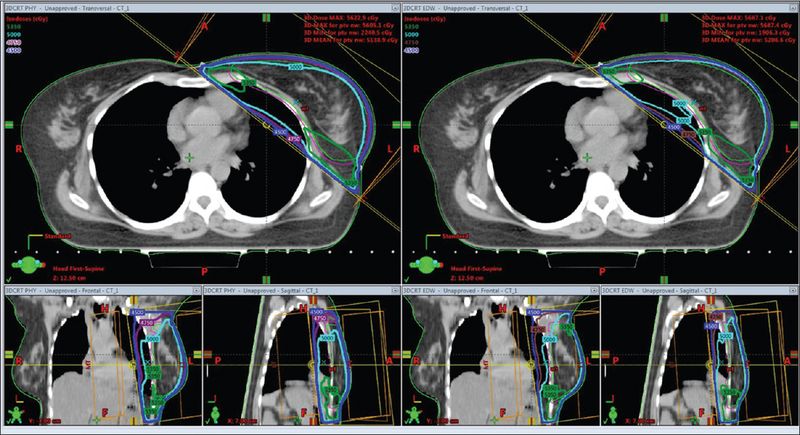 They compared the dose to the contralateral breast, ipsilateral lung, and the whole lung in tangential field radiotherapy for primary breast cancer using “dynamic wedge” which has limited wedge angles compared to EDW and PW. The mean dose to contralateral breast reduced for dynamic wedge when compared to PW. The values of V20 were equal. Their study verified that the dose to normal structures was reduced using the dynamic wedge, thereby reducing the normal tissue complication probability. Similar results are seen in the present study also where all the critical structures including ipsilateral lung, heart, esophagus, and spine received less dose for EDW plans compared to plans calculated with PW. Kelly et al. measured the CBD by comparing four primary breast irradiation techniques and recommends EDW compared to PW. For skin, the mean dose calculated with both the wedges gave comparable results. These results are similar to those reported by Li and Klein. They reported that dynamic wedge and upper wedge systems deliver surface and peripheral doses similar to those of open fields in addition to maintaining wedge-shaped dose profiles that are independent of field size, in contrast to PW. They concluded that complete knowledge of the dosimetric characteristics, including the surface and peripheral doses, is critical in proper choice of a particular wedge system in clinical use. For the same prescribed dose, EDW plan required less monitor units than that of PW plan due to difference in wedge factor, which could probably reduce the scatter dose to structures outside the treatment field. Manickam and Sathyan analyzed treatment plans generated using PW and EDW for head and neck patients. Their results validated that the EDW plans are comparable with that of the PW plan, and the DVH analysis showed that the critical organ sparing is slightly better with EDW plan compared to that of the PW plan. One of the disadvantages of using EDW is its reduced conformity with MLC-shaped fields due to a change in collimator rotation. This will increase the volume of ipsilateral lung coming in the radiation fields in the case of breast plans. But even then, the mean lung dose will be less with EDW plans than PW plans due to reduced monitor units. Furthermore, the normal tissue integral dose (NTID) (dose to the structure body minus PTV) was much less for EDW plans compared to PW plans. Hence, a proper choice of wedge is definitely important while planning the treatment of breast to reduce the dose to critical structures outside the treatment field, thereby reducing the chances of a second breast malignancy. The technologist needs to re-enter the treatment room during treatment to manually place the PW in the proper orientation, thereby delaying the total execution time. Thus, the EDW technique offers reduction of time over PW by reducing the total beam ON time and overall setup time. For EDW, dose versus jaw position data are saved as dynalog files in the machine for each treatment field as the beam is delivered. Hence, a verification of dose delivery with EDW is also possible as a part of quality assurance of EDW. There is no significant difference in the CI of PTV for plans calculated with PWs and EDW plans. No difference in the average of plan normalization values were seen when PWs were replaced by EDW. Critical organ sparing is good with plans using EDW. There is a significant reduction in the dose to opposite breast, ipsilateral lung, and contralateral lung in plans calculated with EDW. The risk of a second malignancy can be reduced with EDW as it produces less scattered dose to structures outside the treatment field. The number of monitor units required to deliver the same dose is less with EDW plans, thereby reducing the overall treatment time. Furthermore, the treatment time could be reduced for EDW by more than 50% compared to PW as the technologist has to re-enter the treatment room for the insertion of the PW into the gantry head. This results in treating more number of patients in the machine. The authors would like to thank Dr. Saju B, additional professor, Mrs. Sarika V Menon, assistant professor, Radiation Physics Division, Regional Cancer Centre, for their valuable advice. Veronesi U, Marubini E, Mariani L, Galimberti V, Luini A, Veronesi P, et al. Radiotherapy after breast conserving surgery in breast cancer: Long term result of randomized trial. Ann Oncol 2001;12:997-1003. Blichert-Toft M, Nielsen M, Düring M, Møller S, Rank F, Overgaard M, et al. Long-term results of breast conserving surgery vs. mastectomy for early stage invasive breast cancer: 20-year follow-up of the Danish randomized DBCG-82TM protocol. Acta Oncol 2008;47:672-81. Khan FM. The Physics of Radiation Therapy. 4th ed. Philadelphia: Lippincott Williams & Wilkins; 2010. Saminathan S, Manickam R, Supe SS. Comparison of dosimetric characteristics of physical and enhanced dynamic wedges. Rep Pract Oncol Radiother 2011;17:4-12. Li Z, Klein EE. Surface and peripheral doses of dynamic wedges. Int J Radiat Oncol Biol Phys 1997;37:921-5. Stovall M, Smith SA, Langholz BM, Boice JD Jr., Shore RE, Andersson M, et al. Dose to the contralateral breast from radiotherapy and risk of second primary breast cancer in the WECARE study. Int J Radiat Oncol Biol Phys 2008;72:1021-30. Boice JD, Elizabeth B, Harvey EB, Blettner M, Stovall M, Flannery JT. Cancer in the breast after radiotherapy for breast cancer. N Engl J Med 1992;326:781-5. Heydari F, Sardari D. How Radiotherapy for Cancerous Breast may put the Opposite non-Cancerous Breast at Risk? International Conference on Earth, Environment and Life sciences (EELS-2014) December 23-24, 2014, Dubai (UAE); 2014. Akram M. Optimum reckoning of contra lateral breast dose using physical wedge and enhanced dynamic wedge in radiotherapy treatment planning system. Int J Radiat Res 2014;12:295-302. Dan W. Comparison between dynamic wedge and physical wedge in the influence of dose to the contralateral breast and lung in radiotherapy for primary breast cancer. Chin J Radiat Oncol 2005;38:295-7. A Randomized Phase III Study of Conventional Whole Breast Irradiation (WBI) Versus Partial Breast Irradiation (PBI) for Women with Stage 0, I, or II Breast Cancer NSABP PROTOCOL B-39/RTOG 0413: March 2011. Available from: http://www.rtog.org/ClinicalTrials/ProtocolTable.aspx. [Last accessed on 2011 Nov 20]. Demirci S, Ceylan N, Haydaroglu A. The organs at risk and radiation tolerance doses. Principles and Practice of Modern Radiotherapy Techniques in Breast Cancer. Ch. 12. New York: Springer Science+Business Media; 2013. Demirci S, Nam J, Hubbs JL, Nguyen T, Marks LB. Radiation-induced cardiac toxicity after therapy for breast cancer: Interaction between treatment era and follow-up duration. Int J Radiat Oncol Biol Phys 2009;73:980-7. Gagliardi G, Constine LS, Moiseenko V, Correa C, Pierce LJ, Allen AM, et al. Radiation dose-volume effects in the heart. Int J Radiat Oncol Biol Phys 2010;76:S77-85. Qiu JJ, Chang Z, Horton JK, Wu QR, Yoo S, Yin FF, et al. Dosimetric comparison of 3D conformal, IMRT, and V-MAT techniques for accelerated partial-breast irradiation (APBI). Med Dosim 2014;39:152-8. Halperin EC, Perez CA, Brady LW. Principles and Practice of Radiation Oncology. 5th ed. Philadelphia: Lippincott Williams & Wilkins; 2008. p. 321-50. Saibishkumar EP, MacKenzie MA, Severin D, Mihai A, Hanson J, Daly H, et al. Skin-sparing radiation using intensity-modulated radiotherapy after conservative surgery in early-stage breast cancer: A planning study. Int J Radiat Oncol Biol Phys 2008;70:485-91. McParland BJ. The effect of a dynamic wedge in the medial tangential field upon the contralateral breast dose. Int J Radiat Oncol Biol Phys 1990;19:1515-20. Warlick WB, O'Rear JH, Earley L, Moeller JH, Gaffney DK, Leavitt DD, et al. Dose to the contralateral breast: A comparison of two techniques using the enhanced dynamic wedge versus a standard wedge. Med Dosim 1997;22:185-91. Kelly C, Wang X, Chu J, Hartselle W. Dose to contralateral breast: Comparison of four primary breast irradiation techniques. Int J Radiat Oncol Biol Phys 1996;34:727-32. Manickam R, Saminathan S. Evaluation of 3-D treatment plans using physical and motorized enhanced dynamic wedges. Med Phys 2009;36:2672-3.